I know it’s slightly early but after finishing work tomorrow we’re heading straight off into a three day food and family fest without proper computer access (we do have it but I’d be roasted alive if my Mother* caught me blogging about a computer game whilst I’m meant to be concentrating on nieces, nephews and other assorted family members) so this is my last chance to hope you all have an awesome time and that Grandfather Winter brings everything on your wish lists. As for me, it seems that Grandfather Winter came early this year because Mr Bigglesworth is already ticked off my present list. Although in this particular shot he does seem to be trying to distance himself from a tastefully dressed levitating carol singing Gnome, can’t imagine why. *Yes I’m afraid of my Mother and with good reason I assure you. She makes Sprout’s PvP bloodlust look like a lazy afternoon picnic. 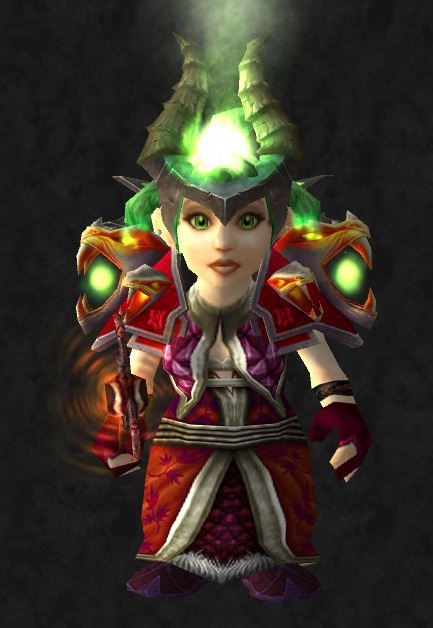 The robes of Volatile Power have always exercised a strange fascination over me, partly because back in Vanilla they were the source of so many arguments. 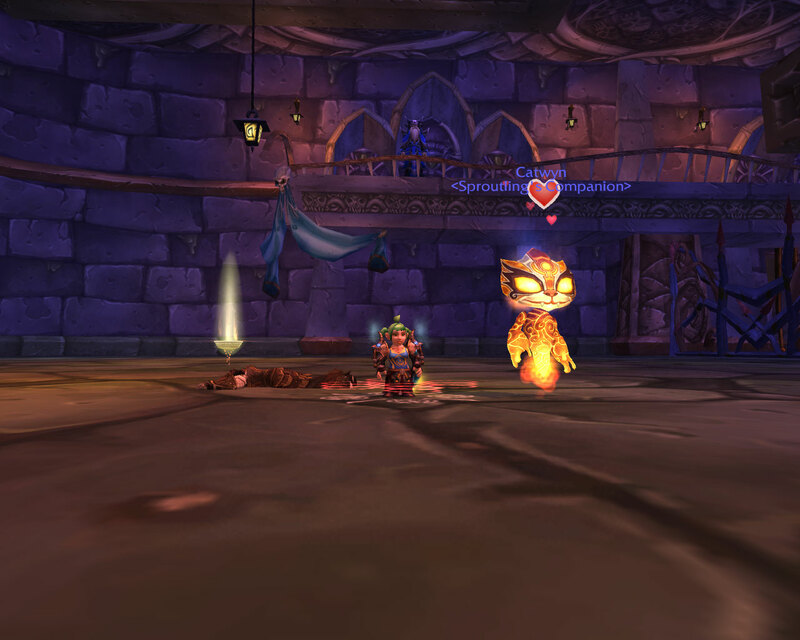 So whilst rummaging around the Molten Core in pursuit of pets, I was happy to come across them lying on a corpse. 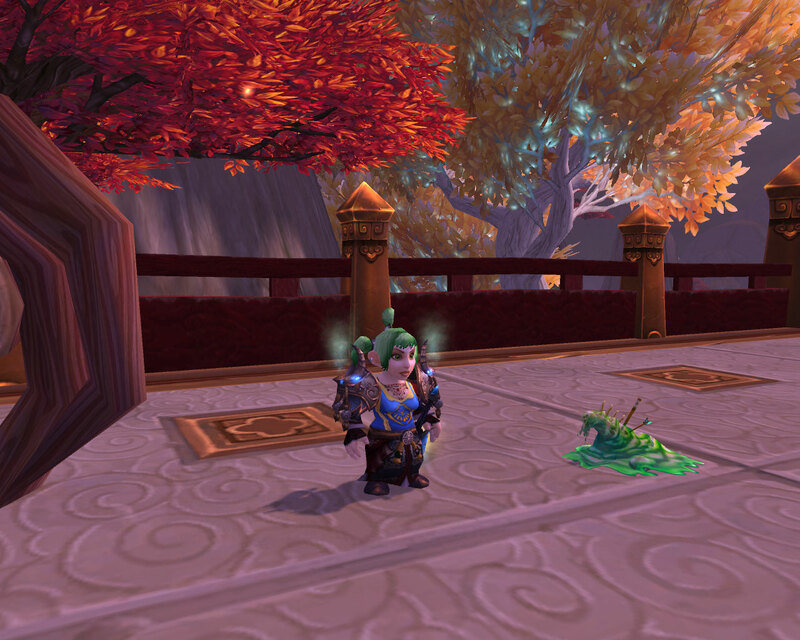 Now Sprout hasn’t had a proper transmogrification since MoP hit so I had great fun breaking out MogIt again and playing around. First up, playing on the purple in the chest piece. The second look is aimed a bit more around Sprout’s green eyes and hair coupled with the fact that I love this hat to bits. Having been both a good little Gnome and a good hard working girl, I’d like my stocking to divulge the following this Winter Veil. Mr Bigglesworth. As a little girl, I had my own pet cemetery moments (at least in the sense of wishing that the dead didn’t have to stay dead) and even now I still in my deepest dreams find myself wishing for undead pets. Since I suspect my childhood dog, his bones bleached white isn’t going to come tapping down the corridor, I’ll take Mr Bigglesworth as a substitute. An end to Dailies. Yes I get the whole “don’t do them” argument but they are there sitting in quest logs and with reputation bars not maxed laughing at me. More time to actually play. What with my commute and with my work load, time outside work not spent asleep is remarkably precious right now. 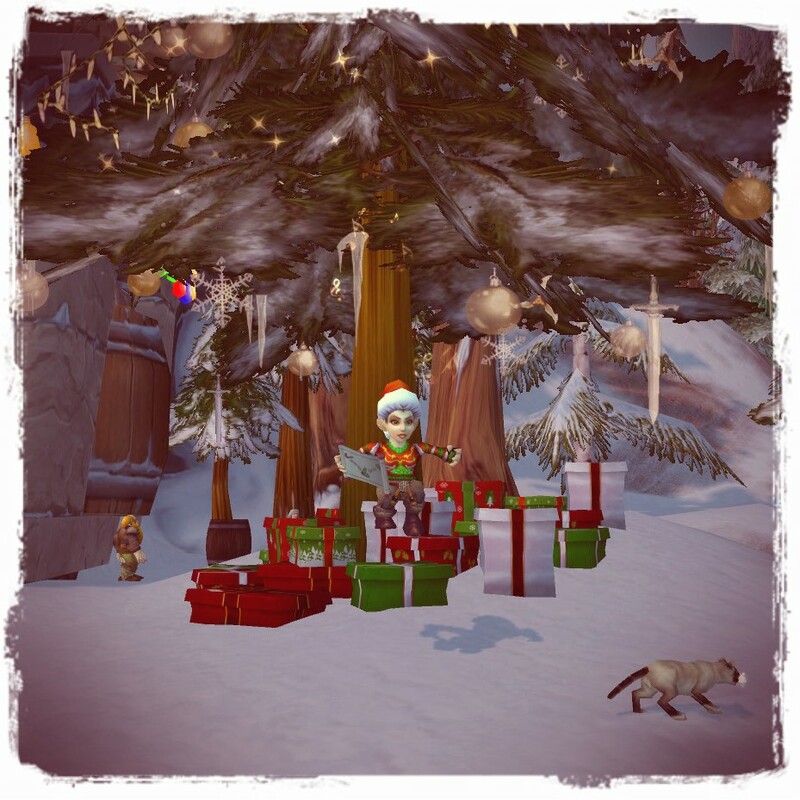 At this time of year especially, there are so many other demands on those fleeting moments that I’m struggling to find any time at all in Azeroth. This one basically leads on from 3. Ideally if every thing goes according to plan, in the new year, we’ll smash the nasty commute into little pieces which then will hopefully allow me much more time to do other things like finish the 100 plus drafts sitting waiting to be finalized, to possibly find a guild to do some raiding with and to complete all the other little projects sitting half done, like my Tree of Life cushion. 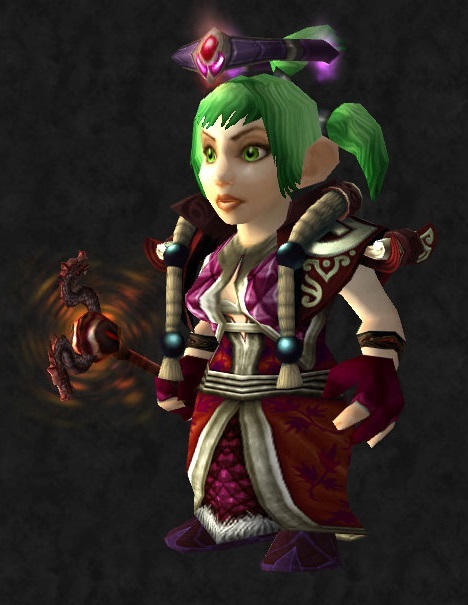 Come up with a Winter transmogrification for Sprout who is still wearing a semi matching set of PvP and PvE gear all collected from MoP and held together by a tabard of all things. 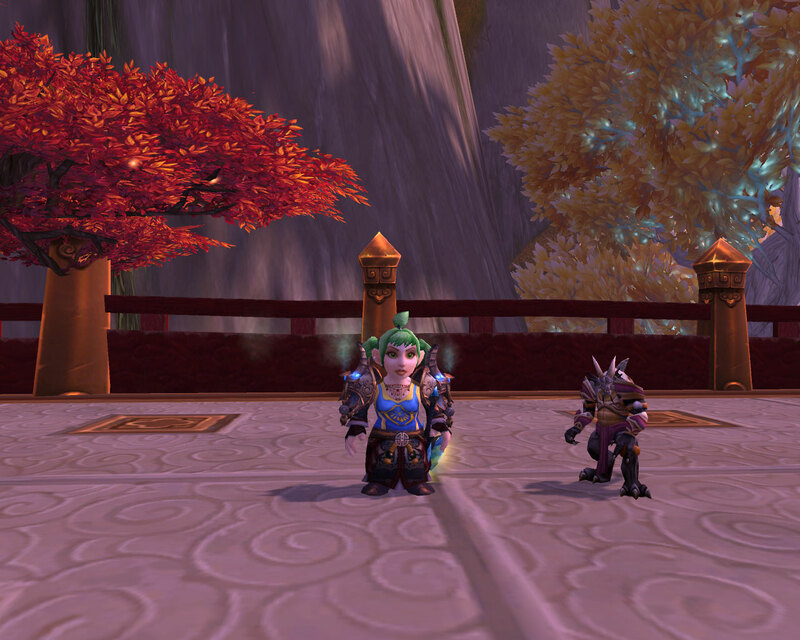 Of course I wouldn’t say no to “Peace on Azeroth and Goodwill to all Gnomes” either. Garrosh’s bloody and battered head in my stocking would be greatly appreciated too. Me and the Auction House now that it’s brimming with pets are a bad combination. Despite still having to build a team to properly take on Major Paine, I decided I couldn’t wait to pick up this particular spirit and some how, without me really thinking about it, money changed hands. The observant amongst you might notice that she’s named after a character belonging to someone we all know and love. I found myself unable to resist, after all, the spirit is clearly cat like as well as being awesome and inspirational. I still have to test how she reacts when presented with large quantities of Human males though. So that brings my total of pets named after bloggers to five with still a huge quantity of pets to go to. I’ve been having a lot of fun revisiting old content this past week. Especially AQ40 which I hadn’t revisited properly since those halcyon days of raiding it back in the summer of 2006. There was definite sadness in the reflection as we cut a swathe through everything, remembering how once it was an achievement for our guild to manage the corehounds properly or the pain that the trash en route to C’thun caused us, but mostly it was enjoyable. The Gods of RNG smiled reasonably favorably on me too, racking up 4 out of 12 pets on my way to Mr Bigglesworth. One from each instance to be specific. Naturally though, the two I want the most, the mini-Gluth that I asked for back in June and the other baby Dog haven’t chosen to make an appearance yet. 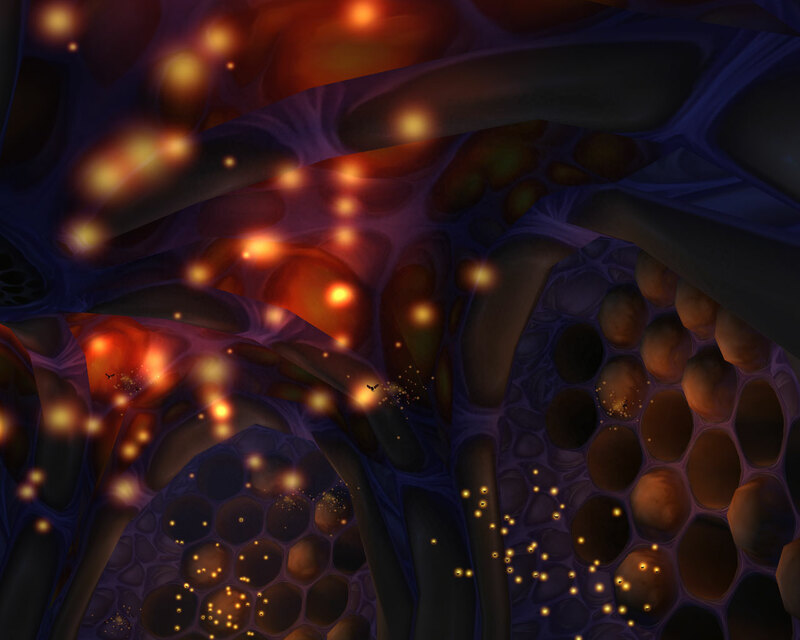 I’m glad Blizzard have added another layer of reasons beyond transmogrification and achievements to push people back into visiting old content because a lot of the mechanics are interesting and whilst at first glance the decor might seem a little dull, sometimes beauty can be found glittering like fireflies in the strangest of places. Given that they seem to be diversifying quite a bit, I find myself wishing that they would add current level versions of each of these old classics so that everyone has the opportunity to experience say C’thun as a proper raid experience, not something you wander in and poke in the eye until he gives you shiny things. The old versions would still remain for adventurers wanting a moment’s solace reliving past glories alone or for the ease of pet farming, pet taming or transmogrification runs but it would a bit of extra spice especially in those dark gaps between patches. I’m not arguing for this instead of new content but to run along side it in parallel to flesh out any missing spaces. Think of the opportunities to add new and interesting things, perhaps a mount who looks like Princess Huhuran* for example along side more pets, more clothes and definitely more vanity items. *Yep I just want to fly around on a giant angry Wasp. 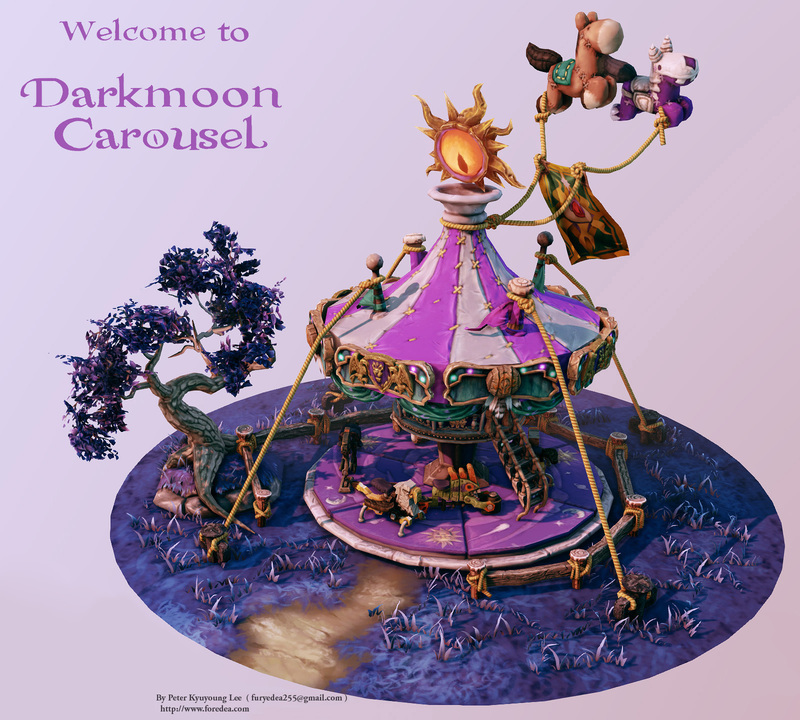 The Darkmoon Faire has rolled into town once again, bringing with it a whole host of new and shiny things to tempt the eye. 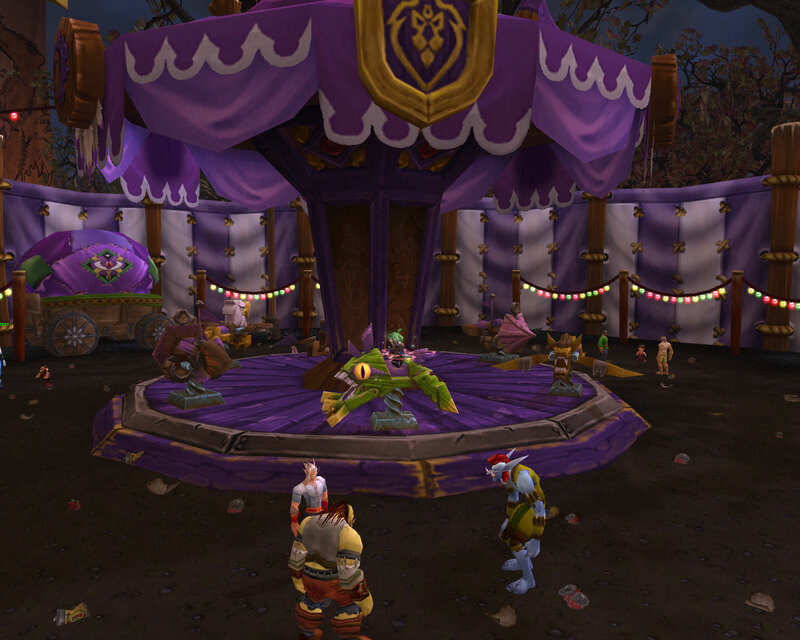 Up first we have the Carousel with it’s experience and reputation buff (sorely needed in the Age of Dailies). 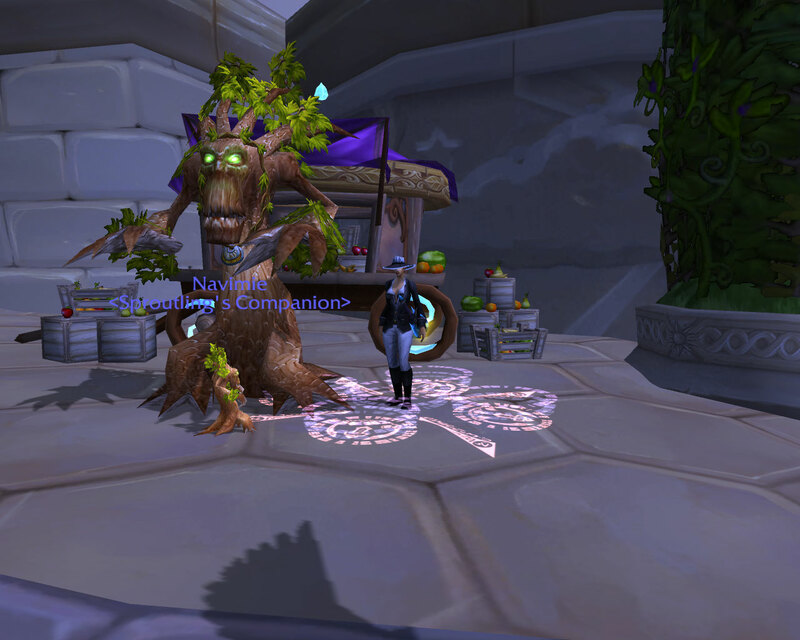 All you have to do is buy a ticket and ride it for a while, just like the Maypole buff from the Fire Festival the duration ticks up the longer you spend spinning around. Unfortunately or perhaps fortunately riding it backwards doesn’t seem to effect your age unlike Bradbury’s. What I also like about this is that Blizzard seem to have drawn heavily on the design which featured in their Student Design Contest, even down to the watching eye on top. Sadly the balloons haven’t made it into the finished product though, perhaps if we’re really lucky they’ll turn up as mini pets some time in the future. The new Pet Battle Master was an okay fight, easier than a certain gentleman in the Argent Tournament grounds for example. I took his team on with a Beast (Spider), a Flying creature (my Cenarion Hatchling) and a Humanoid (my Hopling). My reward bag yielded no Eye but then this week I have been fairly lucky with other pet drops (the Vanilla raid ones and the tailoring ones) so fingers crossed I’ll get one this week as it’s the pet I’m most excited about. Buoyed up by this success, I went and purchased my Darkmoon Hatchling, which when inspected closely has a very prehistoric look. Sprout will definitely be careful when feeding, I suspect it’s pet biscuits thrown from quite some distance. Finally I hit the wilderness looking for the two tamable pets. Finding a Darkmoon Glowfly was easy, the woods seemed filled with them, albeit with a massive level range. 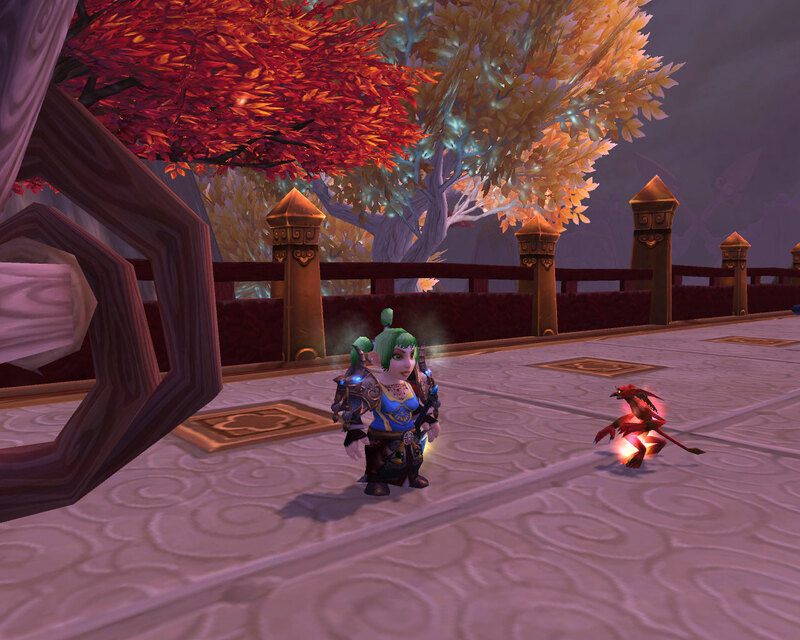 The first one I tamed was level 11 and the first one Mr Harpy accosted was level 1. Sadly it seems that the other pet I actually want, the Crow still hasn’t been fixed. Here’s hoping Blizzard get it done before the end of the week. 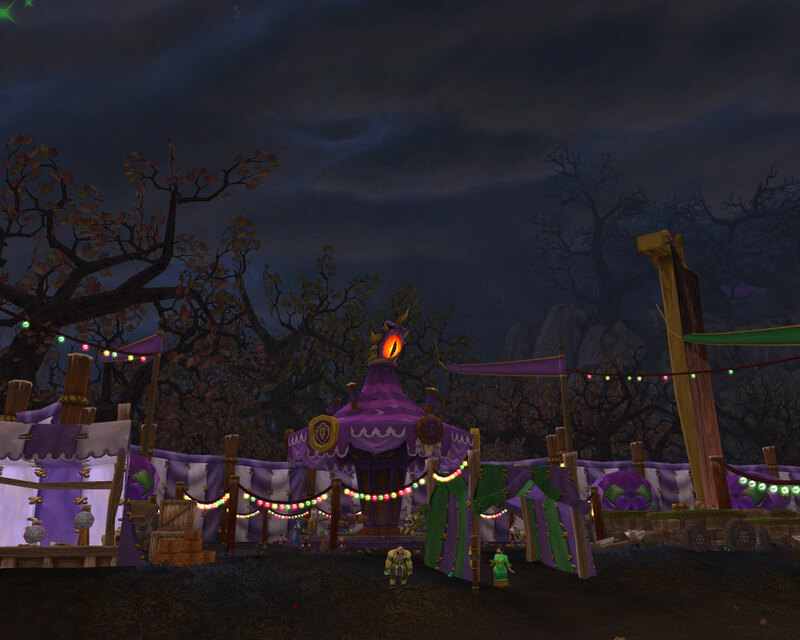 All in all, the new additions to the Darkmoon Faire get a massive thumbs up from me and no doubt I’ll be spending even more time here than before.